Every evening after dark she'd begin to make the sandwiches. She'd spread out peanut butter on the bread, then the sliced bananas. She'd use a whole loaf each night. We'd put the sandwiches out on the wooden platform she'd affixed to the sill of the window that looked into the towering trees behind her house in suburbia. We'd turn out the kitchen lights. Slowly the animals, who'd grown to expect this feast, would emerge from the forest. Raccoons would grip their dinners between their tiny paws and nibble the bread. Sometimes a possum would make a cameo. Their eyes flashed. My grandmother and I would huddle in the darkness on the other side of the window and silently watch. * My mother told me the stories: How my grandmother took in two orphaned raccoons and they raised them as pets. How once she found a crow with a broken wing and healed him. Many people would tell you that feeding wild animals every night isn't exactly good for them, but my grandmother lived for animals, whether or not she followed proper protocol. She wanted to nurture and care for them. She loved them, even though it was something that she was never taught as a child. My grandmother grew up on a farm in rural Pennsylvania during the Great Depression, her father a coal miner and her mother rumored to be less than warm. They'd wanted a boy, but instead they got her. They named her Alva. 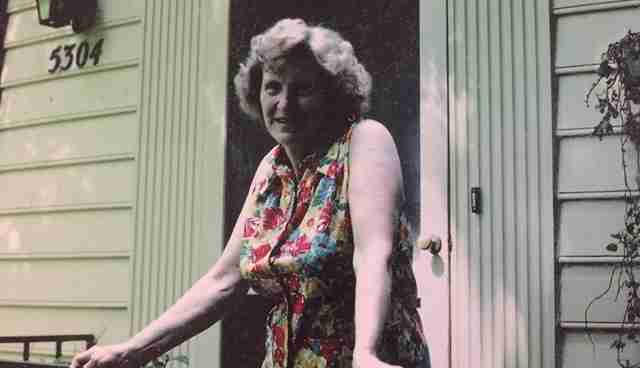 She and her three sisters were expected to work their way through their childhoods. Like the animals on the farm they served a pragmatic function. 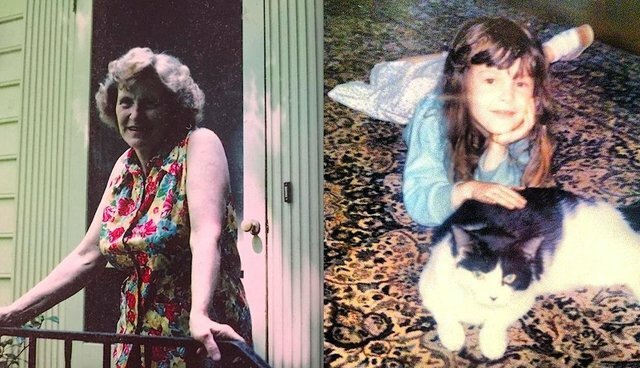 When the barn cat who kept mice populations in check had a litter of kittens, my grandmother as a young girl was told to drown them, one by one. She was taught to do what she was told. She did what she was told. * She didn't revisit the events of her childhood often - or if she did, she didn't speak of it. 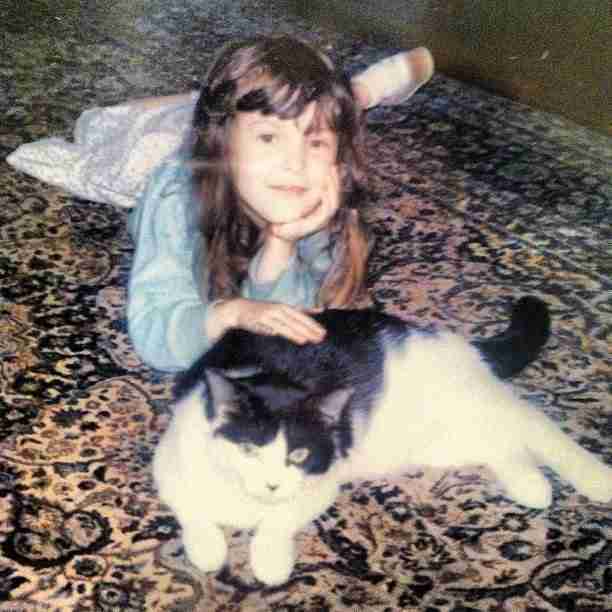 Each evening in her house, when I knew her late in her life and early in mine, she would feed her many cats (Crockett, Bumblebee, Sneakers and Rascal are the ones whose names I can remember now). It was quite the feast. She left cans of wet food all over the house. Some preferred to eat on the screened-in porch and she served them there. The smell of the processed chicken of the cat food permeated the walls, but it was the only meat in the house. When my mother was growing up, there was a point in the late 60s when she started listening to George Harrison and gave up meat for good. Soon after, my grandmother too gave up eating meat. It had never occurred to her before - she was brought up in a place where animals had just two functions: working and providing meat - but suddenly becoming a vegetarian seemed like the obvious thing to do. She introduced me to my favorite books. One was, in retrospect, a surprisingly elegant allegory for overpopulation called "Millions of Cats." Another about an invisible orphaned dog named "Nothing At All." Nothing At All believed that if he spun around very quickly, he could appear and people would begin to care about him. Today, I see writing stories about animals each day as a way of making animals who might be invisible visible. My grandmother's love for the natural world didn't stop at animals. She and I would walk with her dog through the suburban Maryland neighborhood where she lived alone - with her animals. In spring, the gardens were bursting and fragrant. She taught me the names of flowers, how to pronounce them. "Li-lac," she'd enunciate. And I, very young and struggling with my l's, would try to echo her: "Li-lac." * Later on, when her mind was "going," she became more and more disoriented. She put kitty litter in the cat food bowls. She let the garden go. One day, she approached a rabid raccoon who had wandered into the basement of her home, thinking it was Jamie, a raccoon she'd saved decades before. That was when we realized my grandmother was the creature who needed saving. We moved her out of her house. Relatives took her cats. The windowsill was left empty. It's been five years to the day since she died. I would have liked to ask her about the shift that took place in her throughout her life, whether she thinks it was inherent to her nature to love animals, or whether her experiences made her realize animals deserved better. I would have liked to ask her, but I can't. Just recently I read in an essay on varying conceptions of history by the philosopher R.G. Collingwood that cats learn how to groom themselves because they are taught by the generations before them. He argued for this proving something about historical life, but I don't remember exactly what. I'm just trying to live up to what my grandmother taught me to do everyday: Notice the creatures, pronounce the names of the flowers. All that's left is her gravestone in rural Pennsylvania that marks where we buried her ashes in November 2010. Her gravestone reads: "Loved by all creatures, great and small."